CHICAGO, June 17, 2013 – The Loyola University Museum of Art (LUMA) presents three new exhibitions this summer from artists Andra Samelson, Indira Freitas Johnson, and Teresa Albor. Cosmologies, Ten Thousand Ripples, and All That Lies Beyond Us open on July 20 and run through November 3, 2013. Cosmologies is a large exhibition presenting the recent work of New York-based artist Andra Samelson, who is known for using celestial and Buddhist imagery in her art. The exhibition explores the relationship between microcosm and macrocosm, and between emptiness and form, making reference to the connection we have as unique, finite beings to the impersonal infinity of the cosmos. The wall installations take the form of tiny white dots applied directly to an indigo blue wall creating outlines of a mudra (symbolic Buddhist hand position), a sitting Buddha, or a Buddhapada (footprint of the Buddha). These images float off the wall as we connect the dots to form the image. The floor and table installation made of circular spiraling discs and globes appear to be buried in cosmic dust, reflecting and refracting light like a swirling vast universe—not of chaos, but of order. Samelson’s paintings suggest sunbursts and miasmas of cosmic matter running hot or cold as the universe expands and contracts. When the artist uses colored wire to create three-dimensional cosmic clouds of matter, we see a chaotic universe, perhaps string theory illustrated. But when interpreted without any suggestion of the cosmos, these works exist by themselves as expressions of the infinite possibilities of a line drawing with overlaid colors. A third body of work is images of the Buddha in blue or gold leaf on canvas. These paintings appear quietly as devotional objects. To quote Lilly Wei in her essay for the Cosmologies catalogue, “While she [Samelson] has been a practicing Buddhist for over 40 years, it was only after the Taliban’s brutal, sacrilegious destruction of the monumental, sixth-century twin Buddhas in Bamiyan in 2001 that images of the deity appeared in her art. They are homage, an act of reparation. Their presence is an acknowledgment of their absence. These twin forces—that of the physical universe and the mystical—are present in all of Samelson’s projects, intuitively intertwined, one a reflection of the other.” An exhibition catalogue is available upon request. 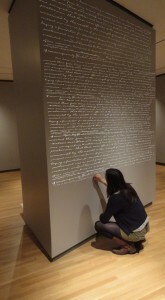 Ten Thousand Ripples is a collaborative project of civic engagement conceived by Chicago artist, Indira Freitas Johnson. 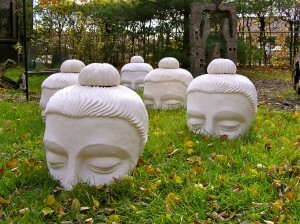 The project began in 2010 with the idea of placing 100 Buddha head sculptures in unexpected locations around Chicago. The idea expanded to include 10 Chicago community organizations who assisted in choosing locations for the Buddha heads in their neighborhoods, which they hoped would initiate conversations about peace and non-violence. Johnson collaborated with the organization Changing Worlds to bring the 10 communities together to work on this project. Johnson is best known for her many large-scale installations and environmental works of art that include using the Chicago River as a vehicle for conveying her message, an Oregon field as a living green background, and drawing on a city park’s concrete walk to create a temporal rangoli painting. Included in the exhibition are photographs, maps, works of art, and videos chronicling each community, plus an installation of 10 Buddha heads now removed from their original locations and brought into the museum setting. The Buddha heads, fabricated from cast resin, have survived the elements during winter 2012 and into spring 2013. More on this project can be found at www.tenthousandripples.com. An exhibition catalogue is available upon request. All That Lies Beyond Us is an installation work and performance by Teresa Albor, who scribes on LUMA’s gallery walls the answers to the question, “What lies beyond us?,” submitted by random individuals to her internet site over the last two years. The author Evelyn Underhill defined worship as “The absolute acknowledgment of all that lies beyond us—the glory that fills heaven and earth.” This definition is what Albor references in her installation, All That Lies Beyond Us. People of all ages, faiths, and nationalities have been invited to participate by writing to Albor about their own evidence that something lies beyond the experience we know of as human life. Visitors to the museum have the opportunity to watch as Albor writes these answers on the wall and may contribute their responses in the gallery or through the website (allthatliesbeyondus.moonfruit.com) over the period of the exhibition. Saturday, July 20, 1 p.m.
New York-based artist Andra Samelson will tour visitors through the exhibition, while discussing her work, the influence of Buddhism, and a lifelong interest in exploring the relationship between microcosm and macrocosm and between emptiness and form. 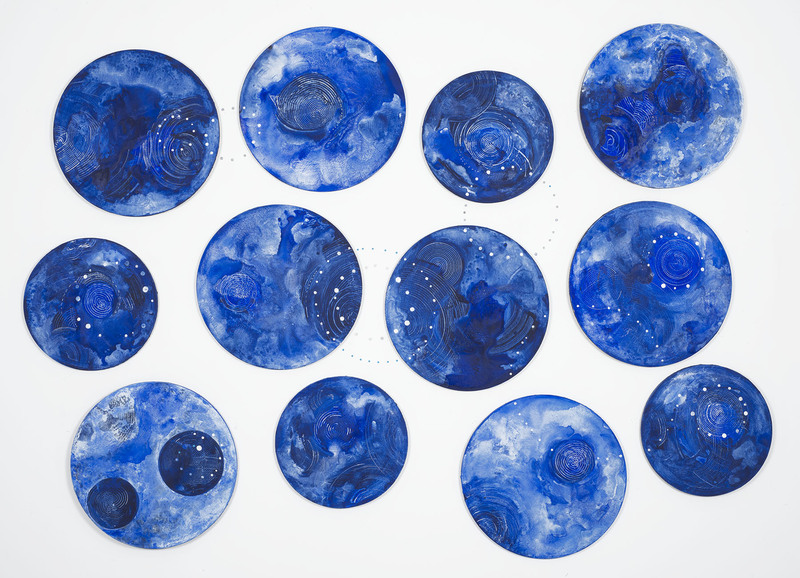 Her paintings and installations make reference to the connection we have as unique, finite beings to the impersonal infinity of the cosmos. Come to meet the artist behind the exhibition Cosmologies. The program is free with museum admission. Tuesday, August 20, 6 p.m.
Evelyn Underhill, a turn-of-the-century poet, novelist, pacifist, and mystic, had an acute awareness of the role of personal experience and its inseparability from one’s spiritual life at a time when state religion was seen as central to belief and faith. Installation/performance artist Teresa Albor will discuss Underhill’s life and writing, in particular how her own work is inspired by Underhill’s assertion that “all that lies beyond us” can be experienced through nature, human character, or art. The presentation will also cover the process Albor used to create her participatory piece. All That Lies Beyond Us is intended to blur the boundaries between artist, author, and audience. Admission is $4 for the public and free for LUMA members and the Loyola community. Tuesday, September 10, 6 p.m.
Michaela Haas, author of Dakini Power, will present the life stories of some of the most accomplished female Buddhist teachers in the West with an engaging slide show recounting stories of courage, wisdom, and determination. Haas is an author, lecturer, and consultant who has practiced Buddhism for almost 20 years. She traveled around the world in search of these biographies. Admission is $4 for the public and free for LUMA members and the Loyola community. Tuesday, September 17, 6 p.m.
Indira Freitas Johnson will discuss Ten Thousand Ripples, a major city wide public art and peace initiative. Rooted in the belief that art can be a catalyst for social change, this exhibition has been a powerful and profound reminder that peace is possible despite the violence that surrounds us. Placed in communities from the far south side of Chicago to the north in Evanston, Johnson’s 100 emerging Buddha head sculptures have sparked dialogue about the obstacles that keep us apart and the commonality that binds us together. Admission is $4 for the public and free for LUMA members and the Loyola community. Tuesday, October 15, 6 p.m.
Dr. Stephen Asma from Columbia College will talk about the way Buddhism breaks down the traditional religious tension between spiritual and mundane reality. Mindful meditation transforms everyday experience into spiritual exercise. Asma will discuss the way in which Indira Johnson’s Ten Thousand Ripples community art project exemplifies the Buddhist message of transcendental everydayness. Admission is $4 for the public and free for LUMA members and the Loyola community.